I'm currently testing new RSS feed readers, and one of the programs that I have been looking at is the RSS reader in Opera, or more precisely in Opera's Mail module. RSS Feeds have been supported for quite some time in Opera. Depending on how you use Opera, you may have troubles figuring out how to add feeds and import a feed list. The process is actually not as complicated as it may look on first glance, especially if you know what you need to do. You can add individual feeds directly by clicking on the feed icon in Opera's address bar when you are on that page. Feeds are automatically added to the Opera Mail module and you can read them in the browser. If you search for "import RSS feeds Opera" you find some pages with tips. Most recommend an opml to Opera RSS converter, an external script that converts the RSS feed list into an Opera compatible format. This is no longer necessary. 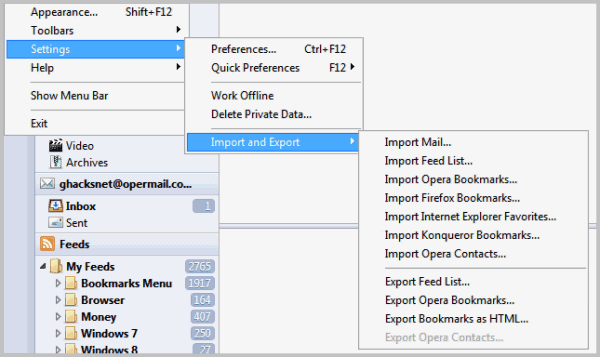 Opera includes everything that you need to import your feed list, and here is how you do that. Click on the Menu button at the top left of the browser screen. Locate Settings in the context menu, and then the Import and Export menu. This opens a file browser. All you need to do know is to load an opml file into the browser. All feeds are then processed by Opera and added under Feeds in the Mail module. For those that do not know, an opml file is basically a text file that contains exported feed information. You can usually create those files in your feed reader of choice under Export. Most feed readers like Google Reader or RSSOwl support this. The feed reader in Opera is basic and resembles an email client as much as it does a feed reader. It is good for reading a handful of feeds but it does not offer enough controls to manage and read hundreds of feeds. What's missing? Filters, preferences (is there a way to change the feed update frequency? ), an option to auto-hide or -delete read feeds and a lot more. The core benefit is there for Opera users who use the web browser as their main browser. They do not need to run an additional program or online service to read feeds, which may outweigh the lack of features in the RSS reader. I’m a big fan of Opera’s RSS reader, but I agree it could do with some work! Having the option to detach the Feeds list from the mail reader would be a great start. You can however change the update frequency by right clicking a feed in the panel and going to properties. Mike you are right about the update frequency. It is not really reasonable for me with hundreds of feeds though. Is not there an option to change the frequency for all feeds at once? editing the “index.ini” mail file when opera is not working (remember to do a backup before attempting this) )and doing a multiple replace on the “Update Frequency” line, you can find one feed with the update frequency you want (Update Frequency=10800 is three hours) and one with the old update frequency and multiple replace all those values. Filters are called “Labels” now since Opera 11 I think, you can again right click on them, select properties and set the settings you want. As for autohiding read messages you just depress the “Show read” button in the toolbar above the feed view, if its not there right click the toolbar and select Customize -> Appearance -> Buttons -> Mail view and drag that button on the toolbar. And a word of warning, Opera for some time now uses a single file per message (because antivirus programs sometimes block or delete the whole mbs file when finding a virus – the previous version did the weekly per account so you could theoretically lose the whole month of an account). It is however not very efficient and can cause you defrag program to take much longer to finish a defrag.To return to the old type mail store you can enter opera:config#UserPrefs|DefaultMailStoreType in the address bar and select 1 as the value. Do this before subscribing to any feeds because any old feeds already subscribing will retain the previous format. I have hundreds of feeds in my Opera reader and I love it. If the mail is not configured (no email account) then there is a button on the read toolbar that says “Update all”. But when you config the email client, this button disappears and a spacer appears. I have not figured how to get it back. I do not see any “update all’ buttons anymore. Opera 11.11 ,Build 2109, XP, no plugins. PS This browser is so far ahead of any others. Amazing. Check out Feedbro: fast, easy & feature rich feed reader as #Chrome extension to replace Google Reader. Feedbro has an integrated Rule Engine for filtering and highlighting, tag support and many advanced other features. Feedbro can also automatically convert Twitter, Facebook and Instagram pages into feeds and has super-easy feed autodiscovery builtin. Feedbro also has Opera RSS reader style 3-column view (+ Google Reader style views).